Rakennustapsa has also decades of experience with diamond sawing and vans equiped with comprehensive list of tools of the industry. If the spot is surprisingly thick, so that the basic saw cannot work on it, the maintenance will bring proper equpment to the work site. Thus, the client work can proceed in the desired time frame and in order. Diamond sawyer is able to saw walls, floor, ceiling, diagonal/corner; hard materials: concrete, bricks, stone, solid rock, tarmac etc. 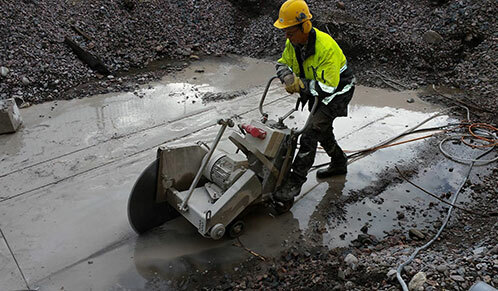 Diamond sawing uses water for cooling and dust maintenance. We have also experience in dry sawing, but it is more challenging, more expensive and the blades are easily damaged from the heat. With modern methods and experience water cooling managment is succeeded quite well, so dry drilling is not the first choice of work method. 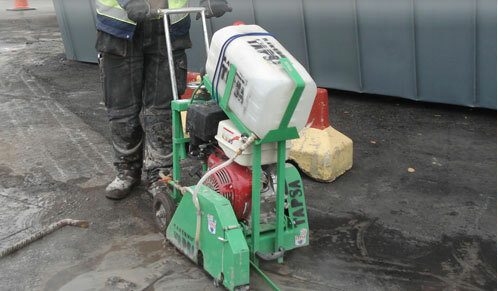 Our services are mainly used by big and small construction companies, but also by individuals. We are ordered for example to modifyi an element, because it does not fit for some reason and then there is rush, because its expensive, when cranes and men idle and the installation cannot proceed. Diamon sawing targets are also making stair, window-, door- openings and manholes and increase their size and also sawing expansion joints, sawing beams and pillars etc. In Infrastructure construction as well as in other construction sectors holding on to work schedules and speed is the trump. It may be, that the path may be cleared just on precise date and our services are required just then. Or wehen wells are being dug up, so often sudden problems may occur and then hasty diamond sawing service is required, so that the work may proceed. Diamond saws: from hand saws to vault- and wall saws. Working with combustion engine from to hydraulic saws. If the structure is so hard, so that the combustion engine cannot work on it, we have for sites without electricity a few trailers with diesel aggregates installed on, which have enough power output for a more robust saw.